At first glance , yes. But I doubt they produce the same sensor with different radius . The process is tricky enough as it is. It seems more viable to produce larger series of one decided radius, and let different camera manufacturers design their lenses towards that. Even if the lenses might not be optimal, they may still reap som substantial cost benefits. If the sensor is fixed and the curvature is the same on all camera brands, with a unified mount, that could be a hit. But as I know Canikonolypana, they want all to have their own system and angle of curvature. This will end by a mess and no lenses will be useable on other brands, not even with adapters. Imagine a common sensor and mount, lenses form all brands fitting one system....., come on let's stop dreaming. The real problem with curved sensors is that if anyone dares introduce them, their customers current lens line-up will be obsolete overnight. Which company would dare do that??? ...well Sony already have about 4 different lens systems, so what the heck, here we go for a 5th lens line-up!!! Would Canon or Nikon dare do that? ...which is maybe why it hasn't been done before. a curved sensor suits perfectly. apart from that, of course for "ordinary" DSLR/DSLMs all current lenses would be obsolete, but the good thing is, a simplified lens design should make it easier to archive a high quality lens, so less production costs 'cause of the design, and hopefully higher image quality, but into the end cheaper lenses, in terms of price, with a matching curved sensor camera, possibly by Sony. Sony has 2 systems: A-mount and E-mount. APS-C and FF lenses in each mount are fully compatible. Many a old 3 lens CRT projector owner have used Torus shaped screens to equalize brightness across a screen. What Sony is doing is basically the same thing in reverse. I can see why they are doing it. If technology like this eventually helps eliminate the need for Dark Field filters [ALL digital cameras use this to help eliminate sensor noise, even in RAW capture, but at the expense of buffer usage]. There are several ways I can see this sort of technology being implemented, most of them positive. I could see lens Chromatic Aberrations being lessened by a order of magnitude of what they currently are. It depends what sort of quantum leap they decide to start implementing this sort of technology. Do they trickle it out bit by bit so not to scare people off? Or do they wait a few years and develop it to it's most likely conclusion, that being used with fluid lenses [or the rear element] that can have their refractive index change by altering the electrical current. Would this sensor even be suitable for an interchangeable lens system? Surely designing an entire system of lenses with exactly the same field curvature would be just as hard as designing them for a flat field? Yes it would be suitable, and they would make it so for one basic reason. To be a success, it has to be a 'Better Option' for PRO's that have spent a fortune investing in , sometimes very expensive lenses. I wouldn't be investing in a lens rental business if looking for a long term investment. @blackwiggle, I'm not so sure. 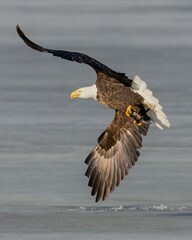 Simple telephoto lenses naturally have less field curvature than wideangles. In this case they'd have to deliberately engineer field curvature into the lens to match the sensor. 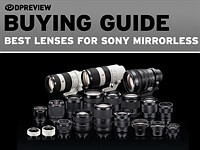 Sony has two lens mounts but four different systems, each one requiring lenses designed for it. One more reason why it would be used for non-interchangable, fixed focal length cameras. @Adrian: I know Canon would dare to do that in a heartbeat. My collection of FD lenses became obsolete when their EOS took over. I can adapt them, but that's not the point here. Manufactures will do whatever fits their bottom line. By the way, I still shoot Canon. 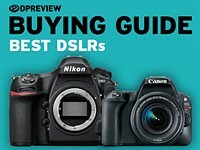 Nikon and Canon has APSC and FF lenses + mirrorless = 3 different systems? Yes, they have 3 lens mounts that cover 4 different systems. Even though you can use a DX lens on an FX camera without needing an adapter, the lens will result in severe vignetting. Which is why they have a "crop mode" for those. The same thing happens when Sony E lenses are used on a Sony FE camera. Naturally, the reverse isn't true. You can always use a FF lens on a crop sensor camera and it will work perfectly. 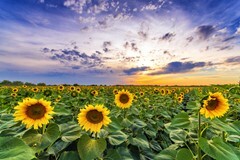 In fact, it will usually work better than using a lens designed for the crop sensor, because the camera is now only using the central part of the image circle. The sharpest part. Okay, a curved sensor has some advantages. 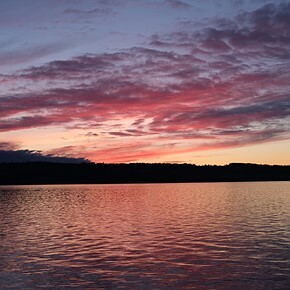 the raw image and the jpeg, that has to serve for flat surfaces of monitors and prints. Question: what is the type and amount of loss, when flattening the curved image? and adobe&co have to do the work, or will the raw images already be flatttend? No additional software coding necessary, since it is still a bog standard rectangular matrix that is being read out.There may be some distortion, but that exists in current cheap m43 lenses as well. the raw files wouldn't be curved, just having a specific resolution given by the tech specs of the sensor, in terms of resolution. well together with the brain...thanks to the evolution of human mankind...if only the brain would auto correct converging lines, just like DxO Viewpoint 2 does...where's the firmware update for brain.exe? I can understand the advantages of a curved sensor. However, I do think it may cause compatibility problems if it's widely adopted. Whilst a flat sensor may not be ideal, at least it is a common standard. If you made an ILC camera with a curved sensor it would make all pre-existing lenses obsolete. We're already seeing mirrorless cameras that take a new range of lenses. It'll only exclude those who want to use legacy lenses or sell off their existing system where there aren't direct replacements. This reminds me of the Sony Trinitron Technology in reverse - from curved screens, to flat in one direction to flat panels! 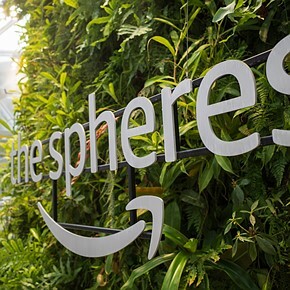 "The team has made somewhere in the vicinity of 100 full-size sensors with their bending machine." I'm Bender, please insert sensor. Finally, i've thought about why don't the camera companies wouldn't develop a curved sensor back into the 2000's...it would make things easier....now Sony seems to have the advantage, let's hope they've designed it right from scatch. I really like how Sony is running circles around Canikon with new developed products every 6 months it seems - and great tech specs. 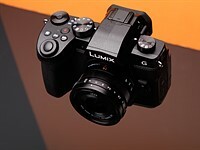 The only thing is: let's hope Sony will show continued support for instance their A7 Series, and not that the "task is done" with their current 1.02 Firmware for the A7/R DSLM. tech, in theory it should be much better than the RX1(R) currently. "God does not build in straight lines." (Some guy in Prometheus). Which is exactly why commercial planes look like bats. Not every lens has the same curve. but they can make new lenses with the same curve. anyway, fixed lens camera would be great if curved sensor really requires simpler lens and produce better IQ. at least on paper it sounds promising. Maybe they'll be able to design lenses that don't feature 1.7 stops of vignetting off centre and lenses then could truly claim to be f/1.4, etc? Additionally, it might allow longer focal length lenses to use fewer elements, not needing ones for field flattening, just ones to make sure image orientation is correct? The eye isn't the best sensor and lens out there. It's a biological miracle, but in terms of acuity and efficiency of conversion of light into signals, it's easily beaten by modern lenses and sensors. Also, modern lenses can do things like zoom, which the eye cannot. There is also something misleading in the article and diagram. It gives the impression that we have high acuity across the whole retina. It doesn't. The high acuity area is only on a relatively small part of the retina called the macular (about 6mm across). Outside that area, we only have peripheral vision. We only get the impression of having a wide field of vision with high acuity due to illusions created by the brain. We actually achieve it by movement of the eyeball. The other miracle of the eye, is actually the processing. The brain straightens out curved lines, inverts the image, subconsciously detects movement and controls focus and "exposure". Most, if not all, of which modern cameras are now doing. The diagram isn't meant to actually be a human eye; it's simply representative of the new sensor design. Also, I wasn't trying to imply that we have high acuity over the entire surface of the retina - simply that it's likely higher than it would have been had the retina been flat (for the case of resolving a flat plane in the scene). Fair enough, but quite a lot of people seem to think the eye is some sort of idealised bit of optics and ought to be the ultimate in imaging systems. Of course, in practice, it's necessarily compromised, partly due to the building available to biological systems and some due to the accidents of evolution. it's just as well the macular region is fairly small, as unlike camera lenses, the eye focuses largely through changes in lens focal length which, of course, changes the field curvature. 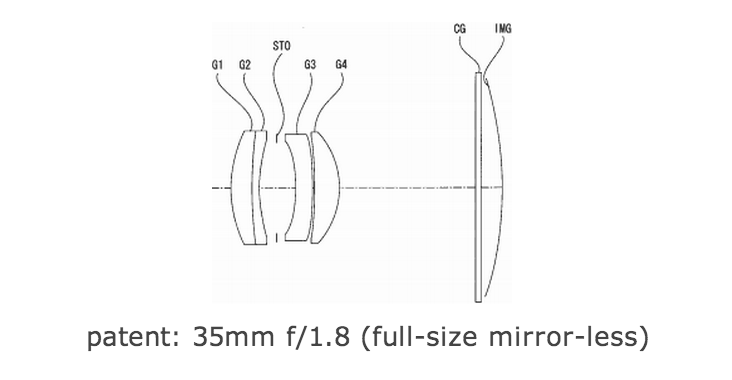 Incidentally, whilst this curved sensor simplifies fixed focal length lenses, it will be interesting to see what the implications are for zoom lenses as fixed-focal length cameras are a minority interest (excluding camera phones of course). I imagine that such zoom lenses could be designed such that the exit rays have a fixed field curvature, but at the expense of a lot of complexity of construction. Yes, it's important to remember that with natural selection, it's more 'whatever works', not 'what's optimal' (until there's a selection pressure that forces optimization, which is itself constrained by the building blocks and randomness you mention). Ah, yes, thanks for reminding us of the fact that the eye changes focus by using its muscles to change its curvature and, therefore, effective focal length. I remember thinking that was particularly clever, but forgot to recall it when rushing this piece out the door. This all makes me wonder just how relevant the eye analogy is, as even the retina's curvature is probably only optimal for the Petzval surface of one - if any - of the focal lengths of your eye. Perhaps the focal length associated with the relaxed state, at infinity focus? The implications for zoom lenses are considerably more complex, as the Petzval surface changes as a function of focal length. Shorter focal lengths tend to have a tighter radius of curvature - so perhaps sensor curvatures could be optimized for those shorter focal lengths. The question then remains whether or not curved sensors would then be able to deal with the natural field flattening that would occurs at higher focal lengths (assuming this natural field flattening is not reversed in some way by the lens design). As for your particular point - it's just not clear to me that a zoom lens with fixed field curvature (over its zoom range) is significantly easier to make than one with a flat field (which is attempted now in some designs, to my understanding). In which case some of the advantages of the curved system dissipate. The eye changes focal length in order to focus. It does not change the distance from the lens to the retina. Therefore, the curvature of the retina can stay constant. So ... if a camera that can focus and that can zoom shall use a curved sensor, then it has to be built with one rear lens group that stays unchanged, i.e. not moving. Then, all changes needs to be made in lenses and lens groups in front of that rear leans group. Should work. The eye changes its focal length by adjusting the curvature of the lens through the action of the ciliary muscle. As the petzval field curvature of a lens is inherently linked to that curvature, by focusing, the field curvature will change. However, just how much it changes is not clear, and as the high visual acuity part of the retina is only about 6mm in diameter, it might not matter so much as the rest of the retina is only used for peripheral vision. So, like many things in evolution, it probably works well enough. As for the field curvature only being affected by the rearmost element, then that's not true. The whole lens design has to be thought through, not just the rear element. I think the most immediate application of a curved sensor should be in cell-phones, associating it to very high pixel count sensors (such as Nokia's "pure view"). 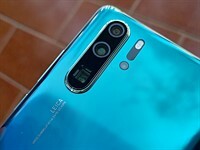 A curved sensor would improve the quality of the image provided by a cell-phone's lens (slim and simple as it must be), and the high pixel-count sensor would allow decent 'electronic zooming'. I suppose that's what Sony is aiming at, having produced a 2/3'' curved sensor. The picture showing the eye is either deliberately deceptive or totally misinformed. The radius of the eye is many times tighter than the Petzval surface of the eye's lens. That is why much of the retina forms a flat tension surface in front of the curved eyeball. The optical system, as drawn, would be substantially worse than a flat retina. Eyeballs are round because eyes tilt and pan. That's all there is to it. May I ask if Sony's approach makes sense in your opinion? Certainly, you may ask. "Sony's approach", if you read their papers, is to induce physical stress in the silicon, in order to alter electron mobility and improve low-light sensitivity. The simplest way to stress a sensor in lab conditions is to bend it. Curvature is an unpleasant side-effect of this process. Once you get past the lab experiments, there are ways of stressing a sensor in production quantities that retain all the many advantages of a flat sensor. It appears that Sony's own PR people, with little to no understanding of the technology in play, have thrown out the baby and are making a tremendous fuss over the bathwater. "It appears that Sony's own PR people, ..."
Now, that's funny somehow and in another way not. But not really an unknown phenomenon (tech/engs vs. marketing/PR). I think the bath water is the electron thing, second order effect, curved sensor will be a significant improvement at the ideal focal length, and less at others ...... but interestingly may make old planar lenses less useful ? how sad, if you want to be with the "in" crowd, you will need new optimised lenses, ideally with manufacturer's correction programs to match, finally make all those old lenses obsolete ? . I agree it is surprising it did not happen on phones first. If I understand correctly, the diagram isn't meant to actually be a human eye; it's simply representative of the new sensor design. Yes, I've definitely heard the 'eyes are round so you can roll them around' argument, which makes perfect sense. One should never imply that a particular advantage is the reason it was selected for - often that is not the case and there are other factors at play. All that said, I was under the impression that the correct degree of curvature in a sensor can compensate for uncorrected field curvature of simple lenses. And while/if I have you here, isn't it the case that spherical aberration is often corrected for by finding a way to increase the effective focal length experienced by oblique light rays (since oblique light rays tend to experience shorter focal lengths in uncorrected, simple lenses)? If so, might this itself not mitigate field curvature to a certain extent? The final lens - with all its elements that correct for other optical aberrations - really has to be considered in choosing the optimal curvature of the paired sensor. I also wonder what the effects of stopping down are, since it helps mitigate field curvature (albeit, not as much as it mitigates spherical aberration). There's a discussion on field curvature in this physics thread. Someone on that also states the retinas curvature does not match that of the field curvature of the eye's lens, but unfortunately without sourcing it. There is a formula for calculating the Petzval curvature of a simple lens but, unfortunately, for other than "thin lenses" (and the eye's lens doesn't qualify as such), you need to know the lens's surface curvature and refractive index, information that seems to be tricky to find. Personally, I'm a bit dubious about the retina's curvature matching that of the field curvature of the eye's lens. It may help a bit, but I think it's more important that the macular region of the retina is small. Sony have likely used an apparently compelling analogy, which is probably only true in part. Such are corporate PR departments. I feel a bit on Internet research coming on. Yeah, it's reasonable to assume that the retina's curvature is not perfectly matched to the Petzval surface, but is perhaps curved enough to afford some benefit. Please tell me when you start 3-D printing the sensor directly on the rear surface of the rear lens element. No dust, no mis-alignment, no stray light, no ..... camera? They already did that some years ago. Lenses do not form an image on the rear surface of the rear lens element (or any lens element for that matter). Think about it. The retina isn't attached to the lens in the eye, but on a surface where the image is formed. The sensor would be the surface. And you mold the rear element to suit the purpose. No law says that the light has to travel through air before it hits the sensor. Actually the human eye uses a gel. There's a certain irony that Leica and Kodak already worked some of this out with curved microlenses in the sensor plane starting with the M8. No, I'm afraid there's no irony there, at all. Fuji (first) then Canon, and then Kodak adopted "offset" microlenses, not curved ones. The lenses still form a flat plane, they just "look inward" to allow the sensor to make better use of the oblique angled rays from fast lenses or lenses with exit pupils closer to the sensor. Exactly, Joseph. Which also makes me wonder if the 2x increase in sensitivity at peripheries Sony quotes is a comparison against sensors with offset microlenses - a more relevant comparison, in my opinion. Oh, I thought it was Kodak/Leica that did the first sensor lenses to look inward or curve if you will. Or vary by position in how they look at incoming light. But if you say Canon and Fuji did it before Leica, I’ll take that. Not that I exactly said Kodak and Leica were first, but the M8 does make significant use of these lenses. Right I shouldn't have said the lenses themselves were curved. But I had thought the array effectively curved. ........ I have thought this was a long time coming - Minox did this 50 plus years ago in their spy camera's squeezing the film on a curved plate to simplify/improve the lens ........... all heading toward a spherical sensor with tubes above each pixel - then the game is over. 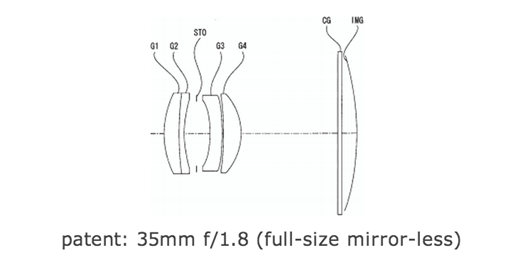 If it works well, and Sony sells bodies using these curved arrays, it will make a lot of optically good older 35mm film lenses more desirable. So you appear to have reversed something. It will also help new lenses, except say lenses from a Leica S2, and some Olympus lenses. Remember human eye has FIXED focal length. If you think again this has no advantage at all for DSLRs and MILCs. Different lens will have different optimal sensor curvature - which means if you need MULTIPLE LENSES to work, you have to correct your lenses anyway - and now it's even harder as the sensor plane is curved! Um, by that logic a flat sensor is going to have exactly the same results with different lenses. This curved sensor makes corners and edges easier to fix--no the fix is not the same for each lens. Now right, it's probably easiest to work with a camera with a single lens of fixed focal length. Actually, the human eye does not have a fixed focal length, except after cataract surgery. Accommodation is the process by which the crystalline lens in the eye, behind the iris, is focused by the ciliary muscle. The effective "focal length", or dioptric power of the eye increases as we focus on closer objects to keep the image on the retina clear. During accommodation, not only does the crystalline lens become more prolate, but it also shifts forward by about one millimeter or so. Therefore, it is more correct to say that the distance from the cornea to the macula, which is called the axial length, is fixed (although axial length increases, slowly, in myopia). A couple of things I don't understand. 1. Photon gathering ability and sensitivity are mentioned in the same sentence as if they were the same thing. I understand that the amount of light entering peripheral sensels will be greater in a curved sensor. But why should a curved sensor be more sensitive than a flat one? And why should the sensitivity vary with position? If they actually meant that the photon gathering ability increases in the centre as well, I'd like to know how that is achieved and what it has to do with curvature. If they refer to the decrease in residual electronic signal (=noise? ), OK that should improve s/n ratio but sensitivity? Maybe someone can tell us how sensitivity is defined here, a complex topic I am sure. 2. Why should a curved sensor be more challenging for interchangeable lenses and zooms than a flat one? Until now they have all had to be designed for the flat standard. Now they will have to be designed for a new curved standard which, according to this article should be EASIER. Obviously there needs to be different lens designs for different sensor radia but that is another story and a potential disadvantage of this tech. Of course it would be great to be able to vary the shape of the sensor but why should it be more desirable on curved sensors than it would be on the old flat ones. Lenses designed for flat sensors surely vary as much as those designed for curved ones? I understand the wisdom in advancing cautiously and try out the new designs in simpler settings first, but that is again another thing. "But why should a curved sensor be more sensitive than a flat one?" It's about better alignment with the incoming light rays. That's the idea. It's probably just to test the tech. 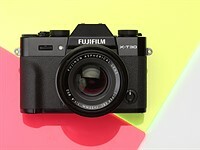 I dont get why they don't do a 1" type sensor, to expand the RX100 series. A fixed focal length, or short zoom (in this case with optics trimmed for the curvation), would fit well in that 1" RX series, as a pocketable alternative for social photography and street fotography. > It's about better alignment with the incoming light rays. That's the idea. Sure, but that applies only to the edges, what makes the centre 1,4x more sensitive? Is photon gathering ability due to better angle of incidence the same as sensitivity? I should have thought they are two different things. rurikw: From the article above: "Sony also found that the bending process improves the sensor's fundamental performance. The strain introduced into the sensor upon bending widened the energy band gap and decreased dark current (residual electronic signal present in the absence of any external light). Both of these achievements should contribute to increased image quality." @ rurikw "Sure, but that applies only to the edges, what makes the centre 1,4x more sensitive? Is photon gathering ability due to better angle of incidence the same as sensitivity? I should have thought they are two different things." So it sounds like they're not really sure, but that kind of makes sense. @ rurikw "Sure, but that applies only to the edges, what makes the centre 1,4x more sensitive?" >The article claims it... "may be due to a better ability to collect oblique light rays entering the peripheries of the lens."... So it sounds like they're not really sure, but that kind of makes sense. Yes but what causes the ability to collect light from a wider angle? Certainly no way curvature could help there? I know there is an ongoing effort to make sensors thinner to have more shallow light wells so they could collect more light from oblique angles but that hasn't anything to do with curvature and is not mentioned in the article. Yes I read the whole article but the above quote came after they had claimed 1.4x sensitivity in centre so I interpreted it as an additional benefit and not related to the sensitivity gain as the word "also" implies. Then of course I don't know the first thing about energy baond gaps and dark currents (sounds scary:-(). The geometry is the only thing I can relate to. Why should it be more difficult to design lenses for a standard curved sensor than it is now for the standard flat one? I imagine the standard could be optimised for normal lenses so WA and tele would be compromised but still less so than now. The flat sensor isn't optimal for any lenses, the standard curved one could be for some. Of course this ALSO gives the opportunity to make really super-optimised sensor-lens combinations as well. So if this comes off there is likely to be a plethora of different standards and one-off solutions. That's a good question about the center pixels in the sensor being more sensitive. All I can think of is that in fact light, and electricity in particular, aren't as well understood as the academy claims. And mechanical stress introduces some mystery factor into the chemical bonds holding the chip together. Then for whatever reason this strain helps improve the sensor's performance. Sounds like major league BS to me. probably someone that dont like Sony, cause even if they are hyping the thing, the theory seems sound. I hope this leads to a tiny, but fast pocketable full frame camera. What would really get me excited would be if they started to make medium format sensors and built a compact fixed lens medium format camera. That would be genuinely interesting. Combine the IQ from larger formats with small lenses and you get a truly ground breaking camera. I dont think the size advantage is that big. The optics can be made somewhat smaller. And the sensor will use marginally less space in terms of surface, but it will add thickness. And medium format is just too big to ever be made compact. Remember, yet again, the curvation adds to thickness and with that large sensor, it would be really thick. "it appears they are fabricated flat, bent into shape using a custom machine, and then backed with ceramic to maintain the bent shape permanently." and why would they be better? did they use curved film or curved sensors back then????? "Desirable". It just means that good film lenses will have much better capacity to work with sensors built on this principle. So those older film lenses will likely become more desirable. It's well understood that flat film can deal with light coming in at an angle better than flat sensors. 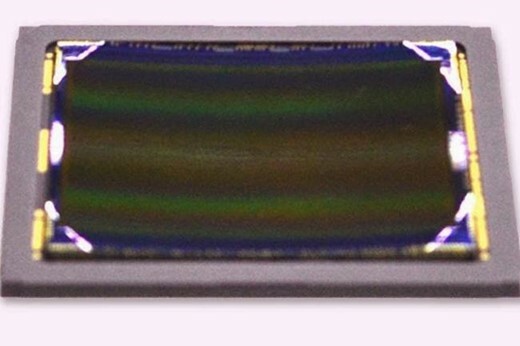 Your old lenses won't work with this curved sensor. Yes, they will. The surface of perfect focus of most lenses (legacy and new) is concave, ie shaped similarly to this curved sensor. 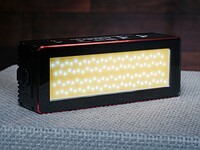 Plus incident light at the edge of the curved sensor is closer to 90 degrees. Sony is always giving you what you want. Don't hate y'all. 1. " it appears they are fabricated flat, bent into shape using a custom machine, and then backed with ceramic to maintain the bent shape permanently. " You can make it cylindrical this way but not "spherical" (curved in both directions). But if it is cylindrical, you need a lens corrected for field curvature in one direction but not in another. 2. "with a 1.4x increase in sensitivity in the center of the sensor as well. The latter may be due...": I like the "may be". Curvature alone will not change anything in the center. 3. " In fact, a 2x increase in photon collection efficiency is reported for the periphery..." Compared to what? To a flat sensor with the same lens, maybe. But to a regular retrofocal wide lens on dSLR, not likely. 4. If the sensor is "spherical", correcting distortions can be a challenge. Curvature changes the electrical properties of the semiconductors, since band gaps are affected by strain and the like. They reported that the sensor evidently benefited from the strain even in the center. Why don't we ask Sheldon Cooper? Sheldon tends to be arrogant and never stops talking once you have asked a question. Then again, how many Sheldons are here? We should open a Sheldon Club, don't you think? Contax and Rollie both produced exotic vacuum back cameras to keep the film perfectly flat. Precision German engineering made a really big deal about that back when. Is Sony throwing us a curve or shooting straight here? Film needed to be flat, because any sections of the negative flat against the backing-plate would be out-of-focus = ruining your pictures - in arbitrary ways - and you had no way of knowing until the film was developed. Unlike flat sensors, film is better at recording light coming in at an angle. Still best to have the film consistently flat across the entire plane. Sure if you wanted to figure out how to make film stretch into a concave surface perfectly, and still advance, you could do even better. Contax cameras were developed and produced by Yashica, Japan (and not by German engineers). Yes, film needed to be flat, but the 35mm film was small and stiff and only when having been loaded in a camera and then not used for quite a while, the first shot or two shots - with a 1,4 lens wide open - might have produced slightly decreased sharpness. No problem, really! Unlike the comparative large film sheets in large format cameras: In order to absorb insufficient flatness the photographer had to stop down to f/22, at least. Here a vacuum film back could have made sense, which was a bulky and cumbersome installation, thought for studio works. Good job Sony, If Sony can bent the sensor freely PLUS software correction, the camera may only need one glass (on elements in one group) which can easily to make a small lens with F1.0 one day. This is pretty significant. It would make lens designer's jobs easier, for sure. This could be exploited in cameras both simple and complex. Kudos to Sony...too bad they won't be the ones to derive the most benefit from this. Flexible sensor with variable curvature for interchangeable lens cameras? My late 80s Minolta 85mm f1.4 fits perfectly onto my 2013 A7 body. I get fast phase-detection AF, and if I had a stabilised lens I would also have IS. You can own an E-mount body and use EVERY SINGLE lens Sony/Minolta has ever made in the past three decades. Sony's backwards compatibility is no weaker than Nikon, and certainly better than Canon when they left FD users in the dust. 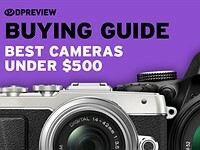 @saralecaire calm down, if you had read the full article you would realize that this sensor will be used on a fixed lens camera, probably in the new RX1. Well not everyone lives as far back with 80's gear which true enough is a benefit in such a case. Though with Sony's own lenses, u need various converters, plus some are dumb and don't even allow aperture control. How compatible are Nikon 1 lenses with F mount? What happens if you try to use a DX lens on a full frame body? Canon have two mounts as well, and again different lenses for APSc sensors that are not fully compatible with Full Frame bodies. Sony took out the mirror for the A7 series, so using the old mount would in no way benefit the lineup, as it would still not be compatible in terms of the image thrown by the optics. And they do make adapters. So what big company are you talking about that is doing it right? Samsung also released another ILC series. And this innovation will give us better image quality. There are other ways as well to improve quality, but curved sensors will probably be a part of that in the future, even if they might be made by others than Sony. "Canon have two mounts as well,..."
Lens smaller, brighter than current RX1 with same price would be great! But I don't see this making into a interchangeable lens camera anytime soon. It's pretty much impossible to make an ILC out of this design. The rear element of the lenses in the system must be at the same distance to the sensor plane, which isn't really possible for different focal lengths. I think this technology will strictly be for fixed lens large sensor compacts. Maybe some day it'll be seen on a pocketable medium format camera. that's why I was making a reference of the RX1. that's a fixed lens compact camera. Do all FL lenses give the same degree of curvature of image formation? If not it seems would be harder to make various lenses cope with the same curvature. I serious compatibility issues with older lenses which actually cope with the flat sensor plane pretty well. The human eye analogy is interesting but sharp focus only occurs in the center of the human eye image and falls off rapidly at the edges. This is a lot of why your eye moves instead of your brains focusing on various parts of the image. Okay, don't be very happy, it means our expensive corrected lenses will become useless on those sensors, also they start to make simple and easy lenses and brand it as (corrected and designed for curved sensors CDCS) and charge us twice as heavy and hard to design lenses that we already paid for,this is not my imagination, that is exactly what Olympus, and later m4/3 did without our attention, it was the same idea, making a 2.8 zoom for a full frame, is much more complicated and costs more as making the same lens for a half frame sensor, but Olympus didn't sell their fast zooms any cheaper than full frame zooms, and that was some kind of cheating, and this new technology will benefit only camera companies and harm our pockets more, the only profit probably is somehow smaller and lighter lenses to carry. An 2.8 zoom is an 2.8 zoom regardless of sensor size. The light gathering ability is unchanged. An F0.95 standard lens designed for any respectable sensor size will therefore always be relatively big and heavy, and a f2.8 constant aperture zoom expensive to make. No, you are wrong, I am talking about the size and cost, the Olympus 12-40/2.8 has the same angle of view as 24-80/2.8 full frame lens, no one yet made a 24-80/2.8 because it will be a monster, a Nikon 24-70/2.8 is 900 grams, while the Olympus 12-40 (24-80 equ) is only 382 grams. Yes the light gathering ability are the same, but the half frame needs half the amount of light, put the Olympus 12-24/2.8 on a full frame camera (if you can) and you will discover that you need twice slower shutter speed as if you mount a 2.8 full frame lens on it, to understand it better, if we do opposite, mount a full frame lens on Olympus, we will get the same shutter speed as a full frame camera, because the extra light will get lost, that is why they made something called speed booster. To make it simpler, smaller sensors need less light, larger sensors need more light, that results in bigger, heavier, more difficult to made lenses. And this applies in some degrees to those curved sensors. Great, my phone with its f/2.5 lens has a better light gathering ability than a $2k+ f/2.8 FF lens! I think what is mentioned here should be "luminance", not "light gathering ability". Ok....answer this question, is it cheaper to make of more expensive? 2. Barely past prototype stage = no economies of scale = more expensive. 3. 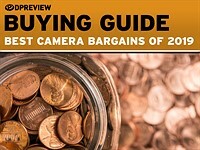 Only usable in fixed-lens cameras = niche market = no economies of scale = more expensive. Sensors will be more expensive whilst lenses will be cheaper! Why? Seems like a logical place to me. Otherwise you have to develop more than one new lens if it's going to go into a new 'system'. If camera manufacture can use curve sensor that will be the great achievement for photography! 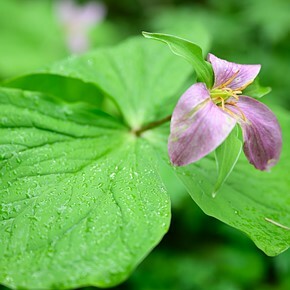 The camera lens can make it simple and achieve better image quality! very interesting. but first, they need to put out actual camera product with it. I am feeling a full frame 20mm-600mm f1.8 to 2.8 that will fit in my pocket coming! And I am feeling a lost kiddo got to a computer with a internet connection somehow. I guess someone didn't get my joke. I thought about that, but even my crazy dreams have a hard time moving too far out of the box. But this sensor just goes to show there are very few limits. A bunch of closer engineer optics nazis on here said the Stylus 1, RX10, and FZ1000 couldn't be done. But they are all here. Fascinating! 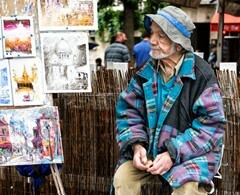 Maybe in a few years, interchangeable lensor cameras, like the Ricoh GXR, will become the new norm. This seems to make lens designs easier and cheaper but the sensor will cost more. An gxr design with this sensor will make even less economic sense as it does now. 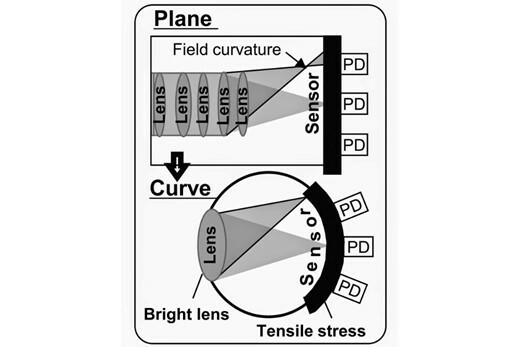 Lens design will be easiest when the sensor curvature is tuned to the exact field curvature of the lens, this will only be achieved in fixed lens systems. Anyway this advancement doesn't have a lot to do with reducing cost, it's more about increasing quality whilst reducing size. I know very little about optics, but it seems that eventually the image will wind up on a flat surface, either as a print or on a computer screen. Won’t it take some doing to get the curved image flattened? Probably just as long as it takes now to get vignetting corrected. Very simple with today's processors. The curved sensor allows you to capture the image better. The lens itself is already curving the light in a way that prevents it from working when using a flat sensor. Bending the sensor corrects for the curve induced by the lens. Its easier to make a lens that can project an image onto a curved or hemispherical surface. You don't need any correction in post at all for printing or for a display. Its simply going to be a better image. 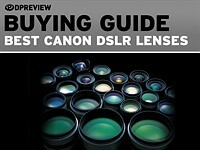 Yes the photography lenses will be better,faster and cheaper! Yes. They can only curve in one direction the way it is described. This makes correcting geometric distortions quite tricky. No, it won't take any doing. A lens takes a flat image - like the ones people take of brick walls to check for distortion - and produce a curved image... which additional lens elements/groups are added to the lens to flatten the image onto the flat sensor. And those extra elements/groups have varying amount of success at correcting for distortion - which is why software in the camera, or post-processing software like Lightroom, DxO, etc are used to help flatten the image. Having a sensor with curvature, which matches the curvature which is unavoidably introduced by the lens, automatically corrects - or "cancels out" - the curvature and gives a flattened image with no other processing required. The same way the curve of the retina in your eye cancels the image-curvature produced by the lens in your eye. And - just like your eye - there is no ability to zoom in such a system. to precision manufacture the "film plane" or in this case, the sensor plane was not economically available previously. Leica approached this concept with their M8 sensor which incorporated tilted lenses in front of the sensor to reduce edge distortion so that their standard M lenses could be used. 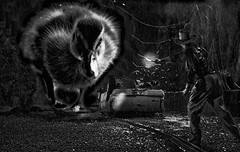 But to curve the sensor and avoid extra compensating hardware is simplicity in design even though the manufacturing techniques to arrive at the solution must have been a real bear. My hat is off to Sony and I'm sure that their customers will line up to incorporate this breakthrough in their many cameras. The obvious advantage will be in in lens design which will result in much lighter and simpler lenses. Of all of the "design breakthroughs" that have been issuing from camera companies for several years, this one is by far the greatest. The idea is as old as the hills (older in fact, the first creatures to evolve eyes had curved sensors) and has already been put to use in telescopes, the breakthrough here is purely a manufacturing one, in the ability to produce curved sensors economically. Okay, I get it. The lenses will be simpler to design, production costs will fall by half but consumer prices will double. Sony is a very smart company, indeed. Haha, but I'm not sure how much production costs will drop once you factor in sensors breaking under stress or sensors not meeting QC demands for perfect curvature, etc. The reason this would be problematic for ILC cameras is that it is counterproductive to the design of digital specific lenses such as the Olympus lenses, although it would seem a good solution for legacy film designed lenses. I can see how this could be used in fixed lens cameras where lenses could be designed/produced at lower cost to take advantage of this sensor design. Digital correction do not correct for field curvature. And your statement is based on what factual information? Digital lenses are designed to cause light to strike the sensor straight on rather than at an angle. It would seem that this would have some mitigating effect on the field curvature problem -- but then, I'm not a lens designer, so I could be entirely wrong. Yes but the whole point is to not require 'field flattening' as a part of the lens' design. The fewer things you have to correct for, the simpler the lens design and the lower the probability that elements introduced to correct one aberration actually introduce another, different one. You'll note that the anastigmat in B has lower overall field curvature, but at the cost of some astigmatism. A (on the left) has zero astigmatism but significant field curvature. It's really difficult to have both zero field curvature & zero astigmatism in a lens. A curved sensor, OTOH, would allow the lens in panel A in that figure to work just fine - allowing for both low astigmatism and field curvature. The fewer aberrations you have to correct in a lens, the higher the potential for (1) simpler lenses and (2) better performing imaging systems. If is this so useful why didn't they do this with film? After all, it's much more pliable! Or do I need to take a closer look at my old Olympus XA? It was done with film. There were a number of simple lens 120-220-620 box cameras with a curved film plane. The results were great for the quality of the lens. And pinhole shooters have known and used the curved film plane benefit for decades. But they never really brought it to 35mm or consumer cameras, did they? "The Complan lens has a curved film plane, hence in these cameras the negative must be held in an arc to improve the edge-to-edge sharpness of the image. The Minox enlarger also holds the negative in this same curve." The box cameras I referred to were all consumer cameras: Ansco Pioneer, Ansco Readyflash, Agfa, Click (I, II, and III) Agfa Clack and the Agfa Weekender. By human eyes as well. No, inspired by the back of your eye. Retina does not produce sharp image. Cornea does. No, inspired by fundamental physics! Missing the humour, guys. It *looks* like the latest curved TV panels. 'Better images' Just how much better can they be with each incremental betterness? Is there a Holy Grail of the very best image?